Subject: Hylaria is now on Kickstarter! Hylaria is a social game that invites 4 to 8 people to join in on 45 minutes of hilarious miscommunication and it’s now live on Kickstarter until August 2nd! 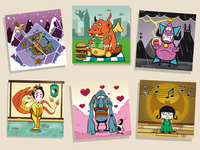 The game consists of 50 tiles, all colorfully illustrated with loads of little details. Luxury pledges on Kickstarter add 2 illustrated scoreboards. Gamers who enjoy games such as Dixit, Mysterium or Charades should check out Hylaria. Players divide into two teams and create a secret code together. Illustrations on the tiles give plenty of options for the secret code. During the game the players use their code to tell their teammates what tiles they have. After this they take a tile from anyone else, friend or opponent, and place it with the other tiles in the center of the table. Find the right tile at the right time and you score points. Of course, this can, and should, go wrong because it is the miscommunication and light heartedness of the game that guarantees a wonderfully idiotic time for everyone!